Can McLaren make an electric supercar that's as fast and rewarding to drive as the P1? McLaren paved the way for a new era of hybrid hypercars with the launch of the revolutionary P1. The British manufacturer is already looking ahead to the future with plans to potentially unleash an all-electric supercar as part of its aim to release as many as 14 new models or variants by 2022. Tesla and Nio have already shown that electric supercars can easily outpace their gasoline-powered counterparts, but developing an EV that’s as rewarding to drive as a traditional sports car is no easy feat. 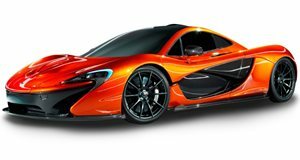 We recently learned that McLaren is still evaluating the possibility of developing an all-electric powertrain. However, Car Design News reports that McLaren CEO Mike Flewitt is reluctant to release an EV until he’s confident that the technology will deliver an even more exciting experience than the P1. "We want an EV McLaren that’s more exciting to drive than a P1," said Flewitt speaking at a recent Financial Times conference. "The challenge is maintaining the attributes that communicate emotionally to our customers. We won’t bring an electric McLaren to market until we’ve cracked that challenge." Considering the pedigree of the P1, that’s a very bold statement. Batteries and electric motors add weight to EVs, but if McLaren’s electric supercar is to exceed the P1 the manufacturer will need to overcome these challenges. Not only will it need to be frighteningly fast, it will need to be lightweight and engaging to drive. As well as electrification, many manufacturers see self-driving cars as the future of the auto industry – but don’t expect McLaren to embrace autonomous driving technology any time soon. "I don’t envisage full autonomy for McLaren,” said Flewitt. "Maybe it would be useful for cities or highways, but we’d return control to the driver when they reach the kind of roads where you’d want to drive yourself." That’s exactly what enthusiasts want to hear.